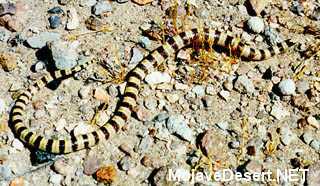 The western shovel-nosed snake is widely distributed throughout the Mojave and Colorado deserts below 1400 m (4700 ft). It is found most commonly in sandy barren habitats in desert flats and washes. It can also be found in areas of scrub and less commonly in rocky areas, slopes and canyons. It is found in greatest abundance in barren and scrub habitats with fine, wind-blown sand about the bases of bushes and tufts of grass (Stebbins 1954). Feeding: This small snake eats insects and other arthropods including spiders, scorpions, and moth larvae. In captivity, feeds on Tenebrio larvae and presumably does the same in the wild (Stebbins 1954). Burrows or swims through sand in search of prey. Cover: The western shovel-nosed snake burrows in fine sand. It also utilizes the burrows of other animals. It probably requires the presence of fine sand or wind-blown sand. This snake has also been found under surface cover objects. They are often found under bushes or clumps of grass. Snakes often lie just under the surface of the sand where they can be heated by the warmth of the sun without exposing themselves (Stebbins 1954). Reproduction: Nothing is known about habitat requirements for reproduction. Eggs are probably laid in fine sand or in burrows of other animals. The presence of fine or friable sand is probably a requirement. Water: Permanent water is probably never required. Pattern: The western shovel-nosed snake prefers fine sand, but can exist in a variety of habitats, particularly where pockets of sand are available. Activity Patterns: This snake is nocturnal. It has been observed on the surface during the day only a few times, usually coiled under a bush. Much of its activity is probably subterranean. It is active most of the year in the south and during the warmer months in the north (Cowles 1941, Stebbins 1954). Seasonal Movements/Migration: None. Home Range: No data. Territory: No data. Defended territories in snakes are rare but nothing is known about this species. Reproduction: The western shovel-nosed snake lays eggs underground. Breeds in spring. Seven females contained an average 3.1 eggs, range 2-4 (Cowles 1941). Niche: This snake is probably eaten by most desert predators, possibly even arthropod predators such as large scorpions, though no reports of predation are known. Nothing is known about parasites, diseases or competitors. This is a secretive, diminutive snake about which very little is known. Cowles, R. B. 1941. Observations on the winter activities of desert reptiles. Ecology 22:125-140. Stebbins, R. C. 1972. California amphibians and reptiles. Univ. California Press, Berkeley. 152pp.l. Chicago Acad. Sci. 8:235-249. Arizona Flora and Fauna Image GalleryChionactis occipitalis Western shovel-nosed snake. Maricopa Co.- Sun Valley Parkway 20 May 2005. Copyright � 2004 Photo by Ryan Sawby.